An important advantage of the innovating multi-platform Advance BIM Designers collection of apps that allow automatic generation of 3D reinforcement for reinforced concrete elements is the possibility of direct integration into the interface of the Advance Design calculation software. One of the many benefits of this integration is a more efficient footing presizing process, after the structure is modelled and a FEM analysis is performed directly in Advance Design. Advance BIM Designers reuses all information related to material, size or forces in a support and automatically generates reinforcement cages, drawings and reports, based on user-defined reinforcement assumptions. Clic HERE if you would like to know more about the Advance BIM Designers or the 30 days free software trial period! Service Pack 1 for Advance Design 2016 is released! We are pleased to announce the release of Service Pack 1 for GRAITEC Advance Design 2016! Advance Design 2016 SP1 is now also available with a new user interface language: Bulgarian. Any customer under maintenance contract can download Service Pack 1 from the GRAITEC Advantage website: graitec.com/advantage. We are delighted to announce you the prize list of the winner of the International User Contest. This competition was opened to all users who completed a project using one or more software proposed by GRAITEC. Participating projects will be evaluated based on specific criteria, such as project size and type, technical sophistication, social importance, innovation, testimonial used metrics, etc. Thanks to all the participants and hope to see you in the next edition! GRAITEC, European BIM software developer for the construction industry, announces the release of Advance Design 2015 dedicated to structural engineering. Advance Design® is specifically dedicated to structural engineers who require a professional and easy-to-use BIM solution for structural FEM simulation and optimization according to specific design standards (Concrete, Steel or Wood). When designing a reinforced concrete structure, engineers must check limit deflections, especially on beams and floors. This is achieved by taking into account the cracked inertia of the reinforced concrete section. However, in FEM calculation, this leads to specific modelling and iterative processes which are tedious and time-consuming tasks for engineers. 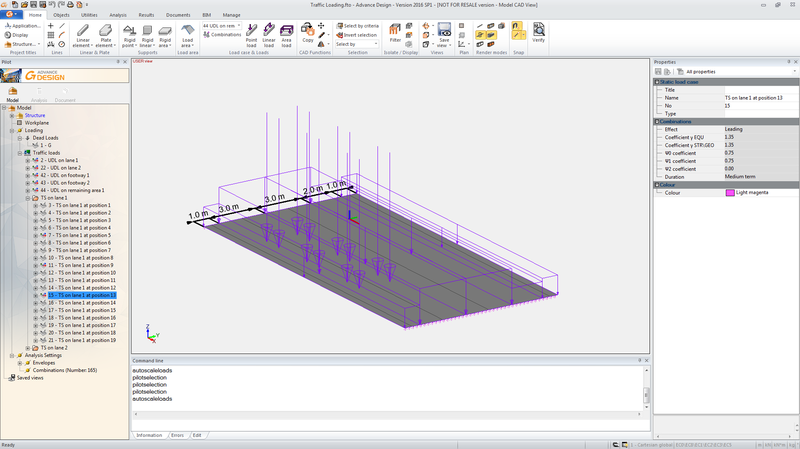 Advance Design 2015 now automatically performs concrete deflection calculation based on theoretical or real reinforcement computed by the software. Process: Successive design steps are performed, with concrete inertia being automatically calculated at each iteration. Concrete inertia is actually given by interpolation between a fully cracked state and a non-cracked state, in accordance with article 7.4.3 from EN1992-1-1. Several other help tools are available: online videos, Graitec Web pages, quick access to the documentation, software configuration… All those tools are specific to each country, depending on the configuration settings. Update of the SRSS modal summation method for faster seismical analysis on simple models. Advance Design 2015 is part of the GRAITEC Advance 2015 Suite that also consists of GRAITEC Advance BIM Connect 2015 and Advance CAD 2015. GRAITEC BIM Connect 2015 allows sharing and synchronization with Autodesk Revit® 2015 models. Advance CAD 2015 is a 2D / 3D CAD software that enables engineers and detailers to modify or create DWG drawings. The 2015 version brings many functional enhancements such as new toolboxes, angular dimensions on dynamic blocks, new dimension styles… as well as improved performance. GRAITEC, European software developer and vendor for modeling and drawing creation for the construction industry, announces the release of the GRAITEC Advance 2014 suite. Designed for structural engineers and professionals in the construction industry, GRAITEC Advance Structural BIM solution provides a complete environment for the development, design and production of all drawing and materials for steel, concrete, and wood structures. GRAITEC Advance is a unique solution provider in the BIM field since it allows users to complete the entire structural process in a consistent environment, from finite elements analysis, to design according with the latest norms (Eurocodes, ACI, AISC…) and automated documentation production required for the fabrication: drawings, bills of materials and NC files. GRAITEC Advance consists of three main structural software solutions: Advance Design, Advance Steel, Advance Concrete, completed with Advance CAD. The “BIM GRAITEC” main characteristic feature is related to its capability to perform structural analysis and fabrication documents under the same concept. More than 10000 users, working daily with GRAITEC Advance, are involved in the design process of various structures such as towers, stadiums, civil engineering works, industrial buildings, stairs, etc. Advance Steel® is specifically designed for steel professionals who require an easy-to-use 3D, powerful structural steel detailing software for automating drawing production, BOMs and NC files. Among all new functionalities of version 2014, two major developments stand out: significant enhancement of tapered beams in Advance Steel and the continuous investment in the ergonomics and ease of use refinements of Advance Steel. On a continuous growing market in the emerging countries that invest more and more in their infrastructure, the use of tapered elements for steel structures increased, especially for portal frames having large spans. However, without dedicated tools to complete large and complex steel projects, the design process can take longer. Advance Steel 2014 provides valuable assistance to all designers with a very comprehensive set of features: a new object, “tapered beam”, which allows the user to define elements having a variable cross section, including the possibility to combine different constraints on each segment (fixed or variable lengths, parallel flanges or not, etc.). Moreover, the user has the possibility to define tapered elements having a hollowed cross section with many options: continuous web or flanges, automatic welding features, etc. All automatic connections work together with this new object – tapered beam. Thus, with Advance Steel 2014 users will obtain quickly all required drawings, BOMs and NC files for these steel members. GRAITEC continues its efforts to improve the ergonomics and ease of use of its software solutions. The Tool Palette has now a variable design: its content can be changed interactively, and a “Favorites” category can contain the frequently used commands. The same principle is used for the management of assemblies and collision checks commands which are still accessible even when the user performs other operations. More simplification: the fusion of all features (holes, notches, cuts etc.) which can be applied on profiles, plates or concrete elements. Likewise, all functionalities used to define structural elements (portal frames, purlins, bracings, connections etc.) were grouped into a new dedicated page in the Tool Palette. Creation of XML DStV files for controlling welding robots, etc. For Dennis BAK, VP-Engineering at Steelway Building Systems (Canada): “Specializing in the design, detailing and fabrication of Pre-Engineering Buildings, which extensively utilizes many types of welded tapered plate beams, we participated in the discussions and checking of the enhanced features in Advance Steel 2014. We were impressed by the number of useful plate features and true parametric connections achieved and we now believe we have the best 3D CAD software for modeling, detailing and manufacturing of welded tapered plate beams“. Advance Concrete® is specifically designed for structural engineers and reinforced concrete detailers who require professional and easy-to-use 3D BIM software for automating drawings creation. With increased performance, Advance Concrete 2014 improves the user efficiency experience, especially when it is used on its integrated CAD platform. It also provides several functional changes in response to user requests. Two of the key features of Advance Concrete (Multi File data storage and multi CAD platform) have been at the heart of version 2014. Performance and robustness have been brought in these two areas: the time to create new views and updating of existing views, has been largely optimized. More improvements in performance, which are very significant, are available: faster reinforcement elements renumbering in complex cases faster “3D Copy” feature which allows the users to copy the 3D reinforcement of an element in all corresponding views with its identification, symbols and associated dimension lines. Lastly, required corrections were made in Advance Concrete, with the target to deliver more stability and significantly higher robustness for Advance Concrete 2014. Improved BIM exchange with Revit: all objects are now imported in Advance Concrete, without limitation in terms of geometry. Steel elements are also imported. Improved modeling capabilities: evolution of the “Adjust” command for circular elements, adding new functionalities to handle the control surfaces (roofs and ramps), etc. Improved functionality for reinforcement: changes in pattern recognition algorithm for the renumbering of reinforcement bars and meshes, new options for submitting bending details for bars and meshes, etc. Improved localization for the Czech market (grades, symbols, labels, representation styles, etc.). Advance Design® is specifically dedicated to structural engineers who require a professional and easy-to-use BIM solution for structural FEM simulation and optimization according with specific design standards (Concrete, Steel or Wood). Advance Design 2014 has many new features and improvements, mainly focused in two directions: BIM and the enrichment of design capabilities. In a context where all structural designers are increasingly receptive to the BIM concept and its associated gains in terms of productivity and safety, Advance Design 2014 provides a set of new features designed to facilitate the BIM exchange in the design offices structure or between the architects and the design offices. The model which is used for structural simulation by the engineer can be a variation of the geometrical model produced by the architect which, in the end, can be significantly different: the elements are coplanar, intersecting axes, the elements extremities which are to closed are merged, small details of the facade are not modeled, etc. Advance Design 2014 offers a range of tools that allows the engineer to greatly simplify the processing of geometrical models into analytical models. The principle: a first audit function identifies non-intersecting axes or nodes which are too close and presents an interactive list of errors. The software then provides automatic adjustment features (magnetic modes, quick projection onto a plane, axis adjustment, etc.) which facilitate the correct geometrical conversion of the models provided from different partners. After the calculation of the structure, when the elements are optimized, Advance Steel and Advance Concrete can retrieve all changes which took place in Advance Design (synchronization mechanism) and update the assembly plans or fabrications drawings. With Advance Design 2014, the aim is to enable the engineer to save a significant amount of modeling time by reusing the information through BIM expertise, while keeping in control the necessary adjustments to achieve the analytical model. Another development for Advance Design 2014,the enhancement and enrichment of the design engines: automatic calculation of the support rigidity based on the properties of the soil layers, considering of real transverse reinforcement for columns (Eurocode), many changes regarding the steel connection design, 2D climatic generator for a quick design study (New ! ), possibility to post-process results on a pre-defined grid for planar elements allowing designers to achieve full gantry and quick study, able to post-process the results of an independent grid mesh element. From April- 17th 2013 GRAITEC presented its Structural BIM Solutions “Advance Steel” and “Advance Design” at the NASCC Conferences in St-Louis, USA. The highlight was the presentation of the new 2013 versions of Advance Steel. The NASCC takes place every year and it is the most important fair for the steel construction industries in the USA and one of the biggest fairs The Americas. The GRAITEC team is very satisfied with the result. They had interesting discussions with GRAITEC customers and established contact with many new qualified prospects. GRAITEC is proud to announce International User Projects Contest! Are you using one or more GRAITEC Advance software in designing your projects? Now it’s the time to show us, and others, how you used Advance Steel, Advance Concrete orAdvance Design in your projects! Beside the attractive awards that we have for you, all projects will be presented on the GRAITEC website and all our social media networks. This will lead to anincreased visibility of your projects and your business. The contest is open to all GRAITEC customers that have completed a project using one or more GRAITEC Advance software, version 2012 or 2013. Participating projects will be evaluated based on specific criteria, such as project size and type, technical sophistication, social importance, originality, testimonial used metrics, etc. The project submitted must have been created with at least one of the GRAITEC software products: Advance Steel, Advance Concrete or Advance Design. Each participant can submit more than one project. Each submitted project will be evaluated separately and has its chances of winning. You can send us your projects to info.contest@graitec.net. If the package intended for submitting is too big, you might consider using a free internet file transfer website, such as https://www.transferbigfiles.com/ or http://www.dropsend.com/ to the same email address. Deadline for submission is September 15th, 2013. BONUS: Top 12 artistic photos will be part of the annual GRAITEC 2014 calendar. You can see here the projects presented in the 2013 annual calendar. For more information or questions, please don’t hesitate to contact us at info.contest@graitec.net.